Home / Grass, Ground Covers, Mats, Static & Thickets / Silflor®MiniNatur / "SILFLORETTES"
PREPARED MATTE MEDIUM - 16 oz. PREPARED MATTE MEDIUM - 'Ready Prepared' 16 oz. bottle of transparent scenery cement. Click image for more details! 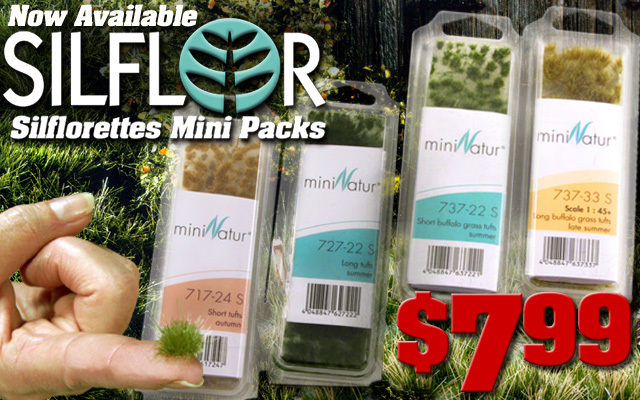 2mm Spring Prairie Tufts - NEW SAMPLER SIZE - "SILFLORETTES!" N/HO-Scale 2mm Prairie Grass Tufts... "Nature's little bursts of excitement sprouting up through the ground!" Ready-made, ready-to-place, simple to use scale grass tufts. Simply glue to any surface. Sample measures 1-1/2" wide by 12" long & contains 75+ tufts! Click image for more details! 2mm Summer Prairie Tufts - NEW SAMPLER SIZE - "SILFLORETTES!" N/HO-Scale 2mm Prairie Grass Tufts... "Nature's little bursts of excitement sprouting up through the ground!" Ready-made, ready-to-place, simple to use scale grass tufts. Simply glue to any surface. Sample measures 1-1/2" wide by 12" long & contains 75+ tufts! Click image for more details! All 2mm Prairie Tufts on sale until May 31, 2017! 2mm Late Summer Prairie Tufts - N/HO 2mm Prairie Grass Tufts... Ready-made, ready-to-place, simple to use scale grass tufts. Simply glue to any surface. Sample measures 1-1/2" wide by 12" long & contains 75+ tufts! Click image for more details! 2mm Autumn Prairie Tufts - NEW SAMPLER SIZE - "SILFLORETTES!" N/HO 2mm Prairie Grass Tufts... "Nature's little bursts of excitement sprouting up through the ground!" Ready-made, ready-to-place, simple to use scale grass tufts. Simply glue to any surface. Sample measures 1-1/2" wide by 12" long & contains 75+ tufts! Click image for more details! Our NEW "Silflorette"-Size Spring Pathways contain 8 strips each measuring approximately 3-1/2" long. Great for N/HO-Scale models, the 2mm Grass Pathways let you create an incredibly realistic, rustic dirt lane with minimal effort! Our NEW "Silflorette"-Size Summer Pathways contain 8 strips each measuring approximately 3-1/2" long. Great for N/HO-Scale models, the 2mm Grass Pathways let you create an incredibly realistic, rustic dirt lane with minimal effort! Our NEW "Silflorette"-Size Autumn Pathways contain 8 strips each measuring approximately 3-1/2" long. Great for N/HO-Scale models, the 2mm Grass Pathways let you create an incredibly realistic, rustic dirt lane with minimal effort! 4mm Spring Leafy Tufts - Silflor® has taken our 4mm classic grassy tufts and has added a highly detailed 'leaf' texture on the tips! Our Spring Leafy Tufts are a bright green multi-tone to provide a natural depth with highlights and shadows! Size and diameter of each tuft is random and natural! One sheet measures 2" x 12" and contains 50+ tufts! 4mm Summer Leafy Tufts - Silflor® has taken our 4mm classic grassy tufts and has added a highly detailed 'leaf' texture on the tips! Our 4mm Summer Leafy Tufts are a medium green multi-tone to provide a natural depth with highlights and shadows! Size and diameter of each tuft is random and natural! One sheet measures 2" x 12" and contains 50+ tufts! 4mm Late Summer Leafy Tufts -Silflor® has taken our 4mm classic grassy tufts and has added a highly detailed 'leaf' texture on the tips! Our Late Summer Leafy Tufts are a burnt green multi-tone to provide a natural depth with early fall highlights and shadows! Size and diameter of each tuft is random and natural! One sheet measures 2" x 12" and contains 50+ tufts! 4mm Autumn Leafy Tufts - Silflor® has taken our 4mm classic grassy tufts and has added a highly detailed 'leaf' texture on the tips! Our Autumn Leafy Tufts are a beige multi-tone to provide a natural depth with fall highlights and shadows! Size and diameter of each tuft is random and natural! One sheet measures 2" x 12" and contains 50+ tufts! 6mm Spring Leafy Tufts - Silflor® has taken our 6.5mm classic grassy tufts and has added a highly detailed 'leaf' texture on the tips! Our Spring Leafy Tufts are a bright green multi-tone to provide a natural depth with highlights and shadows! Size and diameter of each tuft is random and natural! One sheet measures 2" x 12" and contains 50+ tufts! 6mm Summer Leafy Tufts - Silflor® has taken our 6mm classic grassy tufts and has added a highly detailed 'leaf' texture on the tips! Our Summer Leafy Tufts are a medium green multi-tone to provide a natural depth with highlights and shadows! Size and diameter of each tuft is random and natural! One sheet measures 2" x 12" and contains 50+ tufts! 6mm Autumn Leafy Tufts - Silflor® has taken our 6mm classic grassy tufts and has added a highly detailed 'leaf' texture on the tips! Our Autumn Leafy Tufts are a beige multi-tone to provide a natural depth with fall highlights and shadows! Size and diameter of each tuft is random and natural! One sheet measures 2" x 12" and contains 50+ tufts! 4mm Spring Yellow-White Blossom "SILFLORETTES"! Approximately (50) 4mm tufts placed in a nonsymmetrical pattern on a 1-1/2" x 12" long sheet. Spring Blossoms contain bright yellow tufts that mix and transition to all white tufts. 4mm Summer Red-White Blossom "SILFLORETTES"! Approximately (50) 4mm tufts placed in a nonsymmetrical pattern on a 1-1/2" x 12" long sheet. Summer Blossoms contain bright red tufts that mix and transition to all white tufts. 4mm Late Summer Violet-White Blossom "SILFLORETTES"! Approximately (50) 4mm tufts placed in a nonsymmetrical pattern on a 1-1/2" x 12" long sheet. Late Summer Blossoms contain purple tufts that mix and transition to all white tufts.